The weather is becoming frigid, the days are getting shorter, and the last leaves have long since fallen from the trees. Winter is here! If you don't like spending your winters in a warm lounge and you'd rather take in lots of fresh air, you know that you should cherish a high-quality pair of winter boots. Whether it's stylish winter boots for women or robust winter boots for men, there's something for everyone. There's no chance of getting cold feet anymore. When the thermometer reaches its lowest point, it's time to put on some rigid winter shoes or boots. What should my new pair of winter boots be capable of? When it's frosty and unpleasant outside, you need a shoe that can meet high demands. The bitter cold is no problem with the right winter boots! Every shoe needs to be comfortable, of course. But what's so special about winter boots? Snow, rain, dew: Shoes are constantly exposed to moisture during the winter months. This is why good snow boots should always be waterproof. Wet feet could ruin your winter hike altogether. Some models have breathable outer material. Moisture from sweat can escape as water vapor while the shoe remains waterproof on the outside. Perhaps the most important feature of snow boots is insulation from the cold. The feet should stay warm, even in double-digit negative temperatures. Outdoor enthusiasts are still active in winter when the temperatures get cold. That's why the lining on modern winter boots must meet high demands. Cold feet aren't just uncomfortable: they reduce circulation through the mucous membranes as well. This gives viruses and bacteria a free ride. A warm lining made of fleece, cotton, or synthetic fibers protects feet from the cold and keeps them toasty warm. The surfaces you tread on during the cold months pose a higher risk of injury. Rigid soles are a must for winter boots. If the ground is frozen, your footing should still remain safe and firm. 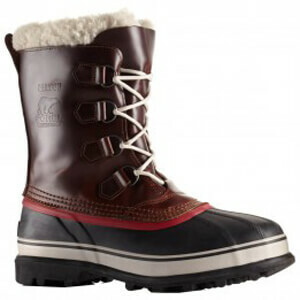 The soles of winter boots have a deep, firm profile, similar to winter tires. This allows them to maintain a grip on icy surfaces and snow-covered hiking trails.